This blue cheese pasta bake is the result of a “fridge dive” using up ingredients in the fridge. I don’t know why pasta bakes have been under used in our house but I intend to change this. Generally do pasta straight with sauces or pesto, our favoured shapes are linguine or quills. I don’t like farfalle butterflies as the centres are still hard when the outside is cooked. Recently I saw a pasta bake in a picture that used this spirally pasta and I went out and bought some – it’s the de Cecco brand in blue and yellow packets. They do all the best shapes! Interestingly though, my Italian friends who used to live with us favoured Buitoni as their dried pasta of choice. One of my new year’s resolutions is to make my own pasta, I have not done this yet but have purchased a pack of 00 flour in readiness. At the weekend I spotted all the big packs of Stilton being marked down in the supermarket – 500g cost just £3.50 and I might have bought 1 kilo for £5 but this seemed a bit excessive. I’m ashamed to say the broccoli and butternut squash had been lurking in the fridge since before Christmas – the butternut squash having had its end sliced off a couple of times to keep it fresh. My mother would probably have thrown it away but beyond the first 2mm of cut surface there was really nothing wrong with it. This pasta bake, served in my late Grandma’s glossy red ceramic dishes fed the family for two meals. All of us together the first time then each of us enjoying a separate lunch or supper. My husband welcomed the change from sandwiches and I’m going to make pasta bake a regular event from now on. 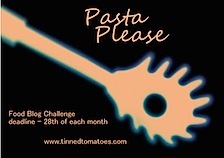 I am sending my pasta bake to two brand new blog events run by my friends. The first is Pasta Please hosted by Jacc and the second is Credit Crunch Munch hosted by Camilla jointly with Helen. That looks just the ticket Sarah. I rarely make a bake now either, but I really should, It look so tasty! Thank you for entering Credit Crunch Munch with this frugal recipe. I’m sure everyone who likes blue cheese would love this (can you tell it’s not me!) Poor husband only get it at Christmas! I did have to work on Ted to eat Stilton. I usually call it stinky cheese which he turns his nose up at but this time I called it “really cheesy cheese”! 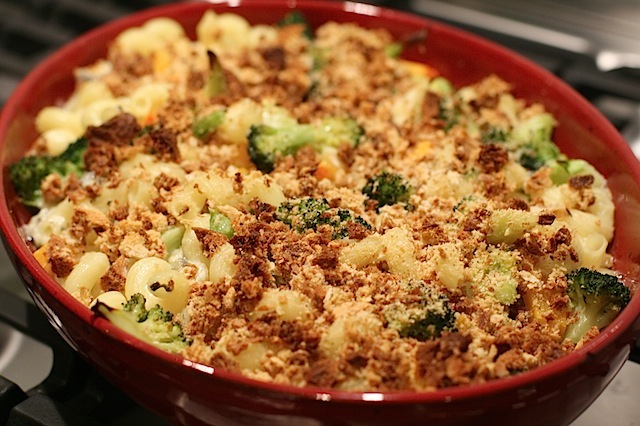 Sarah – our hive mind scares me as I blogged a pasta bake with butternut and stilton today too! Golly! And I’d not even mentioned it to you! I should dig into my fridge more often if the results look this good. I think fridge dives often result in the tastiest of dinners!